I spend my life as a Content Management System Administrator. Below is a short list of the cool (and uncool) tools I use. Much of this is aligned with my Sisyphean objective to be paperless (to be strived for, but ultimately frustrated by the workings of others). Journal Editing. For the Journal of Transport and Land Use we use Open Journal System. This works well for some things, but it breaks down for paper re-review, it does not notify editors a paper has been resubmitted, and there are other bits of wonkyness and user-unfriendliness. On the other hand, it is a much nicer backend than used by many publishers. I suspect all journal management software is a bit wonky. When I review or submit to other journals I am tied to the various CMS for each journal. These are unfortunately not linked, even within same publisher. Single LogIn, at least within publisher would be nice (Elsevier is working towards this, but every time a new journal sends me something, it is not tied together. Spend some of your billions Elsevier and get this working. Also please stop sending passwords in the clear in email messages!). OpenID maybe? Orcid? The consequence is I have many log-ins which are difficult to track, even for the same journal. These are all fixable with effort, but why bother for something used only a few times each? Mail – Mail.app (the backend is Gmail Gopher mail) I used to use lots of rules and folders, but have switched to two major folders, InBox and Archive. If it is in the InBox, it is for me to do. If it is in the Archive, it is done. The problem is long-term items, like journal reviews (sorry other editors), which have their own folder (Reviews ToDo) which I check monthly. This ensures long term items stay out of the InBox and that I don’t return reviews too soon, which just encourages the editors to send more (no good deed goes unpunished). Thus I am trying to follow the GTD rule of “touching it once”. Notes – Evernote and 1Password. Mail.app (MobileMe Syncing). These are for lists of things, like frequent flyer numbers, which I want at hand, or extended bits of work that I do on one machine, but want available on another (work vs. home vs. laptop vs. phone). Addresses – AddressBook.app (iCloud MobileMe Syncing). Note I scan Business Cards via CardMunch on the iPhone, so I can now scan these directly (almost) to the address book. Apparently CardMunch uses Mechanical Turk services, not OCR, as had my previous physical scanner, which seems a step backwards, but probably improves accuracy. ToDo/Project Management – I now use Omnifocus. (I used to use iCal.app (MobileMe Syncing), but this was approximately useless). This is very new, but it seems quite workable. I use Asana for group project management. Blog reading – The tools of choice for RSS feeds are Google Reader Feedbin.me and Reeder for iPhone. With the death of Google Reader, this is an important decision. Feedbin seems to sync reasonably well. Reeder for Mac and for iPad don’t yet have Feedbin integration, but we are promised it is coming soon. Google Reader does not handle some sites well (i.e. sites are not Reader-friendly, and want you to go directly there, presumably because they want ad revenue). All good sites however let you read full blog posts via Google Reader. The list of blogs read can be exported as an OPML file (some of mine are here), which is nice in principle. There were some services (Toluu) that tried to connect people based on their OPML files, but this did not seem to take off. Blog writing – The Transportationist is hosted on a WordPress site ( Moveable Type foundation on the University of Minnesota’s UThink site). I now generally writes posts via MarsEdit rather than the painful web interface … it would be nice to sync this across multiple computers, so I have draft posts where-ever I am. Apparently syncing across multiple computers can be done with Dropbox, using symlinks (e.g. created using MacDropAny), not aliases. Paper indexing – All the papers on nexus are indexed in RePEc – research papers in economics, to ensure they get listed by Google Scholar. References – When I write in LaTeX (MS Word is banished in my world), I create a .bib file, starting usually with Google Scholar, which can export files in BibTeX. I sometimes use JabRef to manage the content in the files. Surely there is a better way. Bookmarks – Safari (MobileMe Syncing). I uploaded my bookmarks to Delicious once, but aside from the bookmarks bar, I don’t really use Bookmarks anymore. Documents – MacOSX (with Spotlight), I don’t quite get the need for separate document management software on my own machine, I can find things, and don’t want to tag my files, folders should be enough. Perhaps if someone could convert folder names to file tags, I could do away with folders. Archiving – The Metropolitan Travel Survey Archive (MTSA) is hosted as a series of flat files, some of which are formatted in XML so that SDA can be used for online analysis. We are considering trying to move files to ICPSR, which is a larger social science archive, for safer-keeping and economies of scale, but the migration involves some pain. We should also have a copy at the Digital Conservancy. Maps, Geographic Data – My lab uses ArcGIS for all its geographic data, but these are stored in the computer file system, rather than their being a good CMS for this, which seems odd, one would think ArcGIS would have better CMS capabilities. Maybe I don’t know enough, or maybe there is an opportunity. It pains me that ArcGIS is not available on Mac. Backup – I use TimeMachine for local backup (though I have Time Machine Scheduler, so it only runs once a day rather than tying up my machine. I once (until 2 minutes ago) used Mozy for off-site backup, but this was really slow, especially for my home machine, and they are ending unlimited backup, so this is on the way out. New solution needed. Finances – The U of Mn has a large Peoplesoft installation, but this is almost totally useless for really basic things, like easily determining the amount of money left in project accounts. Banks have done this online for more than a decade, it can’t be that hard. Other U of Mn stuff – can be accessed by myU or OneStop. I am not clear why both exist. I am not clear why there cannot be a cookie so that as a faculty member, it defaults to Faculty OneStop. I suspect faculty never go to myU, I don’t know about students. Project Reporting – CTS manages a Quarterly Reports system for all the projects that go through them. Fortunately other sponsors like NSF only ask for annual reports. Unfortunately other sponsors like TRB (NCHRP) ask for monthly. Teaching – I use Moodle for course management. This is a great program, which would be better if I could drag and drop files from my desktop instead of using old-skool web-interface. Nevertheless, much high praise to Moodle, which is an open source project. Passive Entertainment – iTunes contains my music, movie, TV, audiobooks, podcasts and many ebooks. The library bends under the weight, and the software seems a bit inefficient, especially with homesharing. Other books are in Kindle format, which is probably the direction I will go for all new books. Podcasts – Instacast Apple’s Podcasts App solves the podcast syncing problem, which is, I don’t want to constantly sync my iPhone via iTunes, which is slow, just to update podcasts, and I don’t want to go to the online iTunes Music Store to download them. The downside is that podcasts sometimes stop if the AT&T network is slow for any reason, and need to be restarted. But this is a really nice App in general. Games – This really needs work (Nintendo, iPhone, MacOS) – I should be able to store Wii games on the system or a server, not use DVDs to load. I also have a set of Board Games (which are not organized), including a set of Railroad Games for use in the class to play with network evolution. Photos, Short Movies – iPhoto Aperture stores these, I have thought about share with Flickr and Everpix. I have thought about MobileMe, Facebook, but dislike, and Wikimedia commons (if I had time to categorize, label, and add metadata to these properly) (and have done trivial amounts on each) but none of these seems ideal quite yet. If Yahoo did not own Flickr, I would trust it more. And with 20K+ photos, it is not trivial to upload. Like iTunes, iPhoto seems to crack under the weight of large libraries. Personal finances – My financial institutions have their own CMS which I must comport with. I have thought about Quicken (or Quickbooks) and would like a solution for Receipts especially that syncs with my tax program, but the upfront setup costs of Quicken dissuade me. Taxes – I use TurboTax, I switched to TurboTax online this year, from offline, but there did not seem to be a way for them to take my last year’s return to populate basic fields. (It says it could, I couldn’t find it). I am disappointed in Intuit for this, but otherwise it seemed to work well enough without crashing or losing all my data. Book index – Our books are almost completely indexed on Library Thing, but this needs a good iPhone app or Mobile-friendly website, preferably with local storage when I am in the basement of a used book store (a cell phone dead zone). Knowledge – I store all my knowledge on Wikipedia, and increasingly Wikibooks (where I have three textbooks ranging from Featured to candidate to in progress). Alas, I have done a brain dump already (I am ranked 3055, a long slip from my number 37 ranking back in the early days (March 2004), I am fairly sure I was higher at some point, but it doesn’t seem archived), so there is nothing non-personal I know that the web does not. I guess there is some other knowledge in my papers and books. Genealogy – I have a set of GEDCOM files encoding my ancestors, my aunt did one side of my family, I did the other side of my family, which are sitting on my computer. I don’t actually have a tool for this. I don’t want to upload all of it without some privacy control, and don’t know if there are any good sites, I played with a few a few years ago, like Geni, but none of the wiki-like sites seems to have sufficiently matured, and Geni disabled GEDCOM. Maybe my children will eventually care or have a school project and figure this out. Buddy List – I have contacts in a variety of IM and communications systems. Address Book as above noted is the primary store for Contacts. There is also AIM, Skype, Facebook, and Google for chat. Fortunately I don’t chat much. I moved my mom from AIM to FaceTime. Shopping wish list – Amazon keeps my wish lists. Backup – At home there is TimeMachine and SilverKeeper Carbon Copy Cloner for the iTunes library, which runs weekly. I periodically copy my home library to my work machine in case of disaster, but this is too infrequent. Offsite backup! – I have killed Mozy, since they killed unlimited, and went with Minnesota-based CrashPlan (if they lose my data, I can hunt them down), though Backblaze seems a worthy alternative. Ebook Conversion – I still seek less paper. We have over 3000 bound books, many of which I would love to replace with electronic versions, if I did not have to pay a fortune to do so. Converting CDs to a music library was painful, but this looks to be god-awful. Simplified CV/Website/Metadata (.rdf) reference management – I seek automatic updating of CV and website from same the reference database. There are programs that do this, from BibRef files even, but they don’t produce the web output I want, so this is still non-optimal. DVD libary – My DVDs are not indexed unless ripped. I need some way to store DVDs in my media library efficiently, and without copy protection, so the content remains available even if the media is scratched. Grocery lists – Tried GroceryIQ but it was laggy, since it touched the server too much and sent needless graphics. Now use paper again. A systematic way to identify needs. Are there categories of my existence that are not cataloged, managed, and described digitally? A Content Management System (CMS) for my Content Management Systems – lets call it a Content Management System management system (C(MS)^2). UMNews reports “Coming soon to a campus near me” The light-rail trail begins Effective May 16, Washington Avenue will close for good to automobile traffic between Pleasant and Oak streets due to construction and then operation of the Central Corridor LRT. Apparently the official title is Washington Avenue Mall. “Washington Mall” would be pithier. 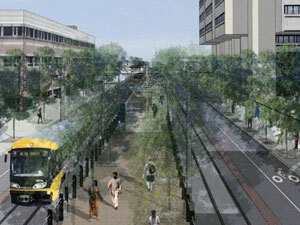 Perhaps “Bruininks Mall” after our soon to be departed President who spent so much of his time on the CCLRT. This is a fascinating proposed technology that could reduce the required battery size and weight, and thus increase efficiency of EVs. I previously noted a proposed technology: turning the road into a solar panel.